Exporting goods to China can be easier than before now. To many international sellers, exporting goods to China has to overcome quite a few problems. Language is a major barrier, how to market their products in a proper channel posed another one. 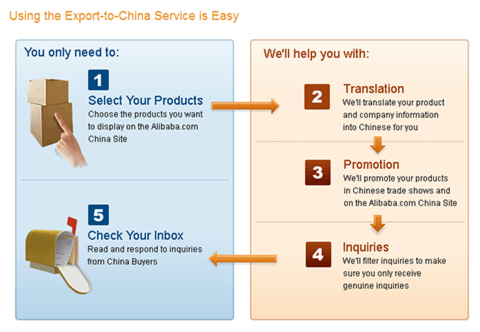 Alibaba International has teamed up with Alibaba China to pull off the “Export to China” platform, enabling international sellers to display their products in simplified Chinese and promoting them in Chinese trade shows. Who doesn’t like photo? We are conceived that buyers, suppliers and trade show goers prefer to see images more than anything else. A good photo image worth more than a thousand words! It brings up site traffic and stickiness. Alibaba‘s newly-established photo gallery has a lot of good images: ornate watches, designers’ partydress, Fendi high heels, you name it. Below you can see a screen shot of products displayed on different windows. How do you feel? We have to admit that we feel odd about its user experience design. There are too many pop-up windows. One click one window. It worn us down using its user interface. When clicking on a product to see another related product image, window is supposed to refresh, display another product. We find the window, along with the next product image, will jump up and down. As users, we don’t feel it enjoyable browsing the product in varying sizes. The page layout is interesting too. We find pictures in some pages have zigzag arrangement. Will it capture more click-through? If I were Winnie the Pooh, I would have complained Alibaba for making my friend pixelized in the product shot! The blog is designed to those who are interested in the latest developement of Alibaba, China’s premier E-commerce portal. We will try to keep a close eye on the latest development of the B2B portal and share the most updated news to you.